National Cable & Telecommunications Association (NCTA) Cable Show Washington, DC – June 10-12, 2013 (Photo: NCTA)I had the opportunity this week to take part in the National Cable & Telecommunications Association (NCTA) Cable Show — a traveling show in the U.S. that took place in Washington, DC, this year. The Cable Show is one of the largest events of the cable industry and this year was also my first time attending. In the U.S. capital, it's difficult to avoid the topic of politics and its effects on the telecommunications industry. This was especially true during The Cable Show in light of recent news around communication monitoring, wiretapping, and how far it's going. But while this was a hot topic on the minds of attendees, politics for the most part was left at the door when it came to the exhibition floor. As expected, a wide variety of exhibitors brought their best efforts to The Cable Show, displaying tools, software, services, and content. 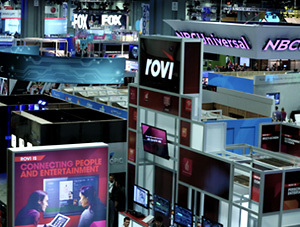 From mega-sized displays showcasing the latest TV shows and series; to rubbing shoulders with famous actors, business celebrities, and reality TV cast members; to viewing the very precise equipment and software that allows all this to come true — this show had it all. This focus on content and new strategies indicates a disruption in traditional cable TV, the strengthening of over-the-top (OTT) services, and the adoption of IPTV. It also raises the question — how long before Quadrature Amplitude Modulation (QAM), which is the format used by cable providers to transmit content, is replaced by IP? Even with all this on site, two displays placed strategically side-by-side caught my attention. One was called the "Observatory" and celebrated the history and evolution of the cable industry and its technologies. The other, "Imagine Park," looked at the path ahead of us. What is the cable industry working on to stay relevant, when competition is continuously increasing? Technology is all about evolution and creating solutions to problems. That said, one cannot simply focus on the future and ignore the past, which is why these displays were so effective. It's good to see that someone is thinking of that — celebrating how far the cable industry has come and how far it will continue to take us. Local Time: Saturday, April 20, 2019 03:22 PM PDT – Page Load: 0.3020 Sec.